I have always wondered what is going on inside of my dogs head when he is asleep. I can tell he is dreaming when I hear his muffled barks. His feet twitch and kick, and sometimes, he twitches so hard he jolts himself awake! Like me, you may be curious about the nature of your dog’s dreams. Do our dogs dream about everyday dog life? Do they experience fantastic dreams, such as flying or having some other superpower? Do they have nightmares? Until science figures out a way to allow dogs to talk, we may never have an exact answer. But, we do have some educated guesses on what is going on in our dogs’ minds when they are asleep. In order for us to understand better what dogs dream about, let’s take a first look at the science of dreaming. What does science say about doggy dreams? As with humans, a dog’s dreams are the result of brain activity during sleep. This is true with all mammals, so what we learn here may be applied to cats and other pets too. Light sleep. During this phase, muscle activity begins to relax. Slow down. Breathing rate and heart rate slow down to a calm rhythm. Deep sleep. The brain begins producing the delta waves associated with deep sleep. Very deep sleep. The delta wave production increases and sleep intensifies. It is most difficult to wake someone up from this phase. Rapid eye movement (REM). The dream phase. This is the one we will take a deeper look at. During REM sleep, the eyes move rapidly up and down and side to side. The body’s muscular functions for running and other activities is largely subdued. But, as we see in dogs (and even ourselves) some movement can slip through! Since we can observe that dogs follow the same sleeping pattern as humans, we know that a dog’s REM phase produces dreams as it does with us. Further evidence exists that suggests mammals experience visual dreams. One experiment with rats found that their brains fire signals in the same spots during their sleep as during their day. Scientists would observe the rats’ brain patterns while the rats ran through a maze. At night, their brains repeated these patterns during REM sleep, indicating that the rats are running the same maze in their sleep. A dog’s brain is much more complicated than a rat’s, so it follows that dogs experience some type of visual stimulation during sleep. In fact, it appears that the dog’s mind yields some form of creativity. If our visual observations of what dogs do during their sleep tell us anything, their dreams are not just re-creations of what they did during the previous day. A study on the English Pointer found that they can assume a pointing position in their sleep as if they were tracking something. This behavior is independent of if the dog tracked an animal or not the day before going to sleep. These results indicate some level of creativity in the scenarios in dog’s dreams and help us determine what it is they dream of. We may never know if dogs experience more fanciful events, like flying, but their re-creation of known experiences is something we can observe. Since their brains appear to be capable of developing their own scenarios, they may have dreams of chasing a ball and a squirrel at the same time! As with humans, dreams are a combination of memory and experience, so it would not be shocking to discover that your dog even dreams about you! And yes, this research also suggests that your dog can have nightmares. Perhaps your dog may have a scary dream of the ball chasing him instead of the other way around! Do small dogs dream the same as big dogs? If you have spent time with more than one dog of different breeds, you may notice that the smaller breeds more frequently exhibit signs of REM cycles. These cycles tend to be shorter in length too. This may have something to do with the pons Varolii. Without getting too technical, the pons is part of the brainstem found in mammals. When the pons is small, underdeveloped, or inhibited, the body’s muscles are more active during sleep. 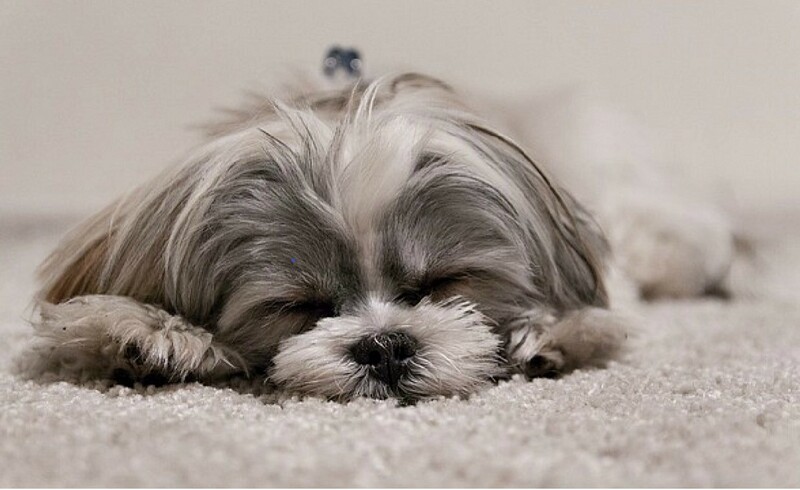 Since puppies and small breeds of dogs, like Shih Tzus, have a smaller pons, they display more physical signs of dreaming than we see in larger breeds. Is it bad to wake a dog up while he is dreaming? Not exactly. It is not physically harmful to your dog for him to wake up during the REM phase of dreaming. However, it may be better to let your dog keep on dreaming when you see him twitching in his sleep. Waking him up interrupts his well-needed rest. It’s just rude! And, at worst, if he is having a nightmare or is an aggressive situation, he could lash out in confusion. So, it is probably best to not wake up your dog. After all, if your dog is dreaming of something like chasing the biggest bone he has ever seen, he might not be ready to wake up! 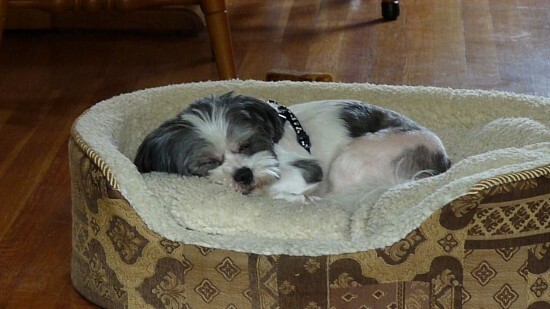 Let sleeping dogs lie, and enjoy the cuteness of your furry best friend living in his imagination. 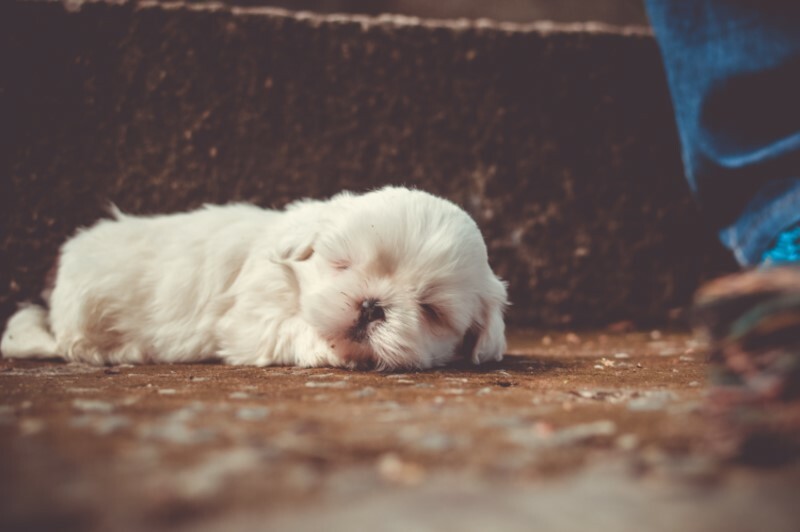 If you had a dog dream and wondered about the meaning, you must understand that dream analysis is said to be highly subjective. So, with that said, when you dream about a dog it is best to understand your own thoughts and feelings about dogs in general, and what you felt upon waking up from this dream. To me a dog represents loyalty and unconditional love. So say I had a dream of a dog being aggressive and menacing. This dream may be symbolizing a negative experience with a friend or co-worker. A dream may provide you with a little insight about things going on with you in your life, but to decipher what it means depends on what events are currently going on in your own life. We tend to dream of things that are affecting our daily lives.